And all Hartlepool’s Michael Rice really really wanted in the wake of his victory in last night’s Eurovision You Decide was a crisp sandwich. He absolutely loves ’em. Mans Zelmerlow presents You Decide champ Michael Rice to the fans and bloggers. The 21-year-old was presented to assorted Eurovision fans and bloggers last night in a suite a few floors up from the studio in Salford’s MediaCity UK where about 20 minutes earlier his version of the her-yooge gospel anthem Bigger Than Us was announced as the public choice to go forth for le Royaume Uni at the 64th Contest in Tel Aviv in May. You could safely say he was chuffed. The performance of Bigger Than Us which earned Michael Rice the UK ticket to Tel Aviv. Our boy in Israel is a very likeable chap. Unassuming, honest, humble and just the sort of everyman a world can get along with (could this be just the ace up its sleeve a post-Brexit UK needs on an international stage? 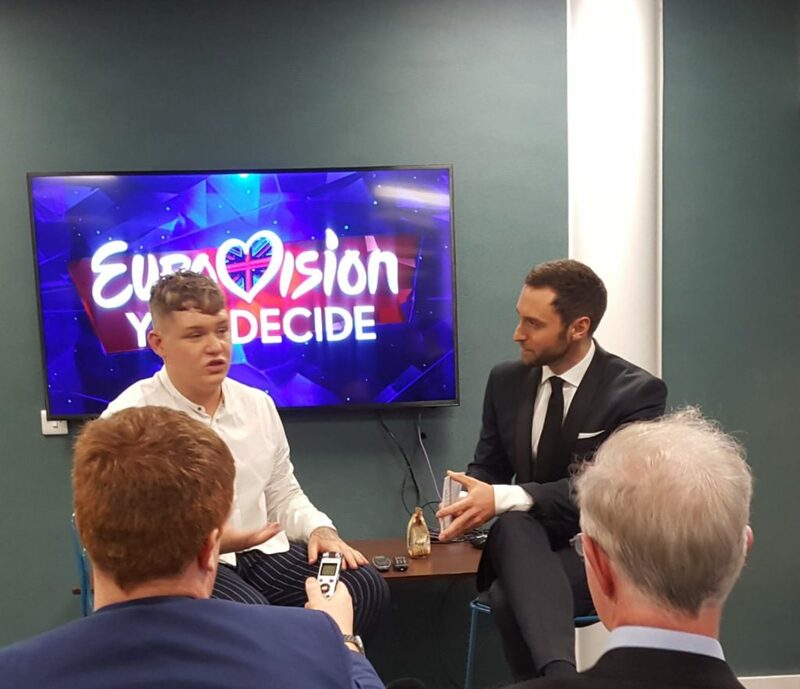 ), one of the biggest things on his mind during his light grilling was that he still hadn’t had a chance to speak to his mam after a brief whirlwind of reprises, press shots and now winding through the rabbit warren of Dock 10 Studios to chat with a gaggle of loyal Eurovisionistas. “I felt like I just had to go out there tonight and perform.” he says in a discussion of his tactics for the show. “This is for our country and I had to show that I could do it. “I think the new format [with two versions of the same song]was good. People have different tastes so it gave people a different like, genre and variety of what could be taken to Eurovision. Me and Holly [Tandy, the other performer of Bigger Than Us] have become best, best friends. We’re going to do a duet of our song and she’s been lovely. I’ve said I’ll get her tickets to Tel Aviv, she has to come! Michael’s vocal dexterity won him the first series of All Together Now. Wrap your ears around this performance of Leonard Cohen’s Hallelujah. Bigger Than Us were in direct competition with each other. Not that there was anything small about the performance of Bigger Than Us in Salford. At one stage, Michael was giving it so much welly, he thought his blazer was going to rip. “It was dead tight! I thought, ‘it’s going to rip any minute and I’m going to crouch down and my trousers are going to split! It went really well though and I can’t wait to watch it back and see what I did. As far as Michael is concerned, the 99 days between You Decide and the final in Tel Aviv will be chock-a-block with rehearsals and a promo trail he’s really looking forward to as besides everything else, he’s rarely been abroad. There’s even the possibility of a Eurovision logo being added to his collection of tattoos. The family’s waffle and crepe shop may just introduce a Eurovision-themed filling to the menu and there’s a strong possibility he will ditch the blazer that caused him those wee onstage niggles. Otherwise, he sounds ready. He sounds raring. He sounds as though he can’t wait to be Contest ready. And he’s unequivocally earned that crisp butty, hopefully served with a flute of champagne. “I definitely think you have a really good chance,” Mans says at one point, completely unprompted. And a winner, you can argue, should know. After so many years in the Euro wilderness, could we finally be on the cusp of something? Only three months ’til we find out.